AUDI/VW Airbag Reseter works without additional computer and trough car OBD II connector can erase airbag sensor "crash data" or only fault memory. Honda Crash Data reset Tool allows to delete wrong data/crash data. Interface assigned for deletion of record of event of crash in drivers which 2 and 3 connection using TMS320. In complete description about connection to driver. SI-Reset BMW OBD2 resets service and oil inspection in BMW cars with OBD2 socket. SI-Reset BMW OLD resets service and oil inspection in old BMW cars. SI-Reset OPEL OBD2 resets service and oil inspection in OPEL cars. 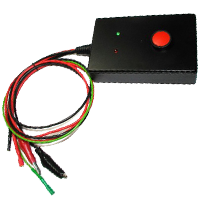 SI-Reset VAG OBD2 resets service and oil inspection in VW, AUDI, FORD, Seat & Skoda Cars with OBD2 connector (w/o can bus).